The last itinerary of the day before we left Kuala Lipis was to visit the zoo. For unknown reason, the place is not popular at all and not mentioned by many people. I came to know about this place from one of the articles I read during my research and it was mentioned only once. We had trouble looking for the zoo. Not to mention the clutter, can you spot Zoo Lipis sign? But again, the sign is not clear and it is too small for human eyes… unless you wear telescopic glasses. The turning to the zoo will also lead you to Hotel Centrepoint and the birthplace of Malaysian Prime Minister, Najib Razak. 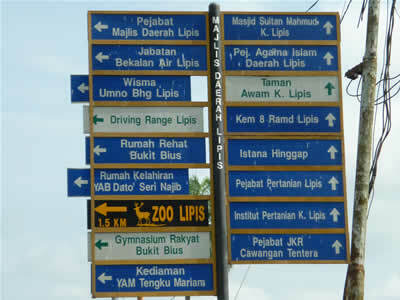 Follow the hilly road for about 10 minutes, you will see a big sign telling you that you have reached Zoo Lipis. The zoo is built on Bukit Bius. The first impression of the zoo was the place is not properly maintained. The staff behind the counter was looking for the misplaced tickets. Without tickets, we couldn’t go in. After a few minutes after they found the ticket that we were allowed to be in. Although Zoo Lipis is not comparable to other bigger zoos in the country, it has enough animals to fascinate my two children, especially K. He was so curious and so interested in the animals. He asked many questions to satisfy his curiosity. 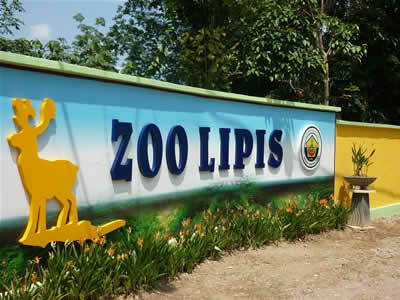 In Zoo Lipis, you will see bears, deers, monkeys, crocodiles, owls, eagles, parrots, etc. If you plan to go there one day, mind your steps as some are steep and could be slippery on wet days. As I mentioned before, the cleanliness of the zoo is not up to par. If you can, avoid the toilets at all costs. Besides that Zoo Lipis is quite a fun place to be with your children. Note: This is the 7th article of A Family Road Trip to Pahang: Bentong, Raub, and Kuala Lipis series.